Our values are rooted in the people that make up our diverse school community, which is influenced by the myriad, rich cultures and histories of Walthamstow. 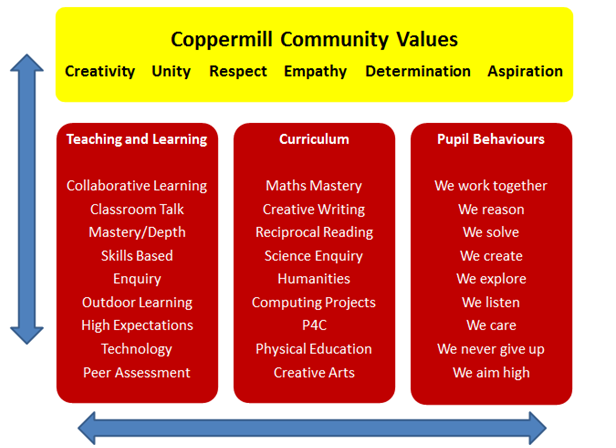 In particular Coppermill is proud to be a hub of creative thinking and this is reflected in our curriculum and the range of innovative pedagogies that underpin teaching and learning. These practices ensure that learners become more resilient, creative and curious. Our range of enrichment opportunities and special weeks open children’s eyes to the possibilities of the world around them. Activities range from karate, rock-climbing, crochet and gardening to enterprise projects, sports, dance and film-making. These experiences empower Coppermill pupils to pursue their passions and challenge themselves in ways they might never have thought possible. All learning is embedded through regular opportunities for discussion and collaboration and an emphasis on child-led enquiry. These feed into specific curriculum subjects, for example mathematics, where collaboration, reasoning and talk are fostered by our maths mastery approach. In literacy, learning is enriched through ambitious technological projects that build on computing skills, for example imagining Roald Dahl novels in the world of Minecraft. Outdoor learning is a significant feature of Coppermill’s enquiry-led curriculum, with opportunities to explore the world beyond the classroom. We are particularly keen to make use of our fantastic nearby marshland, which has been used for shelter-building, science investigations and geography projects, but learning equally takes place through short trips to local places of interest or just as an excuse to get out into the open air! Progressive skills development is fundamental to deep learning at Coppermill and our curriculum is balanced to ensure that its content supports this. For example, children in Year 1 learn how to follow directions and use a basic map; in Year 6 they manipulate 6-figure coordinates to pin-point specific geographical features and chart a complex course on real terrain. Purposeful learning opportunities also capture real-world events, in particular those with relevance to children’s lives. In Early Years children have built a rain capture mechanism to learn about water conservation whilst older children explored the arguments surrounding the 2016 EU referendum through P4C sessions and a short video project. We urge you to watch: What makes a Coppermill Pupil 2018 to see more of our wonderful curriculum in action!